I love potato chips and I have to share my latest guilt-free snack discovery with you — popchips! These chips are so good I’ve been dreaming about them. Popchips are potato chips that are neither fried nor baked; they're actually popped under heat and pressure. Using this method, the chips have all the flavor and half the fat of a typical potato chip with no trans fat, no saturated fats, no cholesterol and no preservatives. 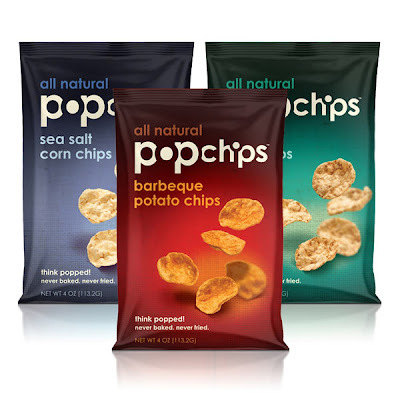 Popchips are on my hot list and the five flavors range from good to amazingly good — better than baked chips. Love them. What does this have to do with grooming you might ask? Well bathing suit season is just around the corner and the good news is that a satisfying one-ounce portion, 20 to 22 chips, has only 120 calories—and since they’re popped, they leave no greasy fingers. Winner! Mmmm. These sound good. Where did you purchase them? In NYC they're sold at Duane Reade and Target Stores.